No other book in Germany has had such a large print run for so many years. The first issue of Lustiges Taschenbuch came out on October 1st, 1947. This month, 40 years years later, the 260-page monthly pocket book celebrates its anniversary with 4 special issues. The first issue will be reprinted and made available again, and next month’s issue #369 will have a special gold/silver cover and contain 40 extra pages! 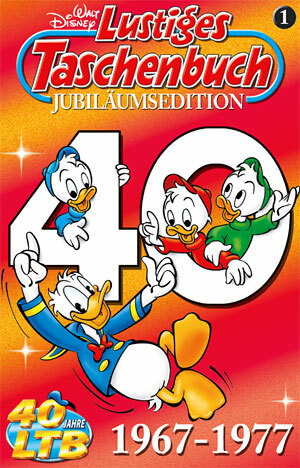 Each year 13 new issues of Lustiges Taschenbuch are published. If you put all issues on a bookshelf you’ll need a shelf of 5 1/2 meters (18 feet) long to store the more than 360 books that have published so far. 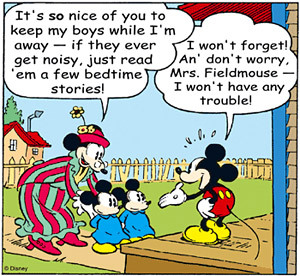 That’s nearly 100,000 pages of Disney comic stories! Visit the LTB official website and see the TV commercial for the 4 special issues on the homepage. Here’s the cover of the first special issue that came out on 19 September. The seven space shuttle astronauts who returned to Earth with Space Shuttle Endeavour on August 21st will be honored in a day of ceremonies at Walt Disney World on September 10th. Check NASA.gov for a schedule of events.